Ideal as a luxury beach or lawn tent, fabulous Indian theme Wedding tent or exotic Moroccan themed lounge tent, the regal Maharaja conveys an aura of the majesty of days gone by and is perfect for a refined, romantic setting. 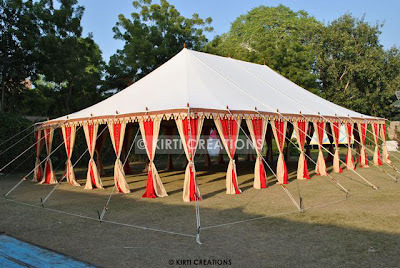 The Maharaja tent is a traditional pole tent which requires staking and comes in two sizes. The standard Maharaja is 20’ x 34’ and it’s big brother, the Grand Maharaja, is 27’ x 44’. Each Maharaja tent has a separate exterior and interior, scalloping, pole covers and drapes allowing flexibility to get just the look you need for your event. Choose from the classic ivory, dove egg blue, lavender or deep red exteriors. Interior sets are available in a variety of print/ color combinations including; celeste blue, honey glow beige, dove egg & sand and ivory. We can use a large choice of drapes to either complement or contrast against the lining, allowing you to bring more colors in for matching with your linens, flowers and other elements. For a larger gathering, Multiple Maharajas can be fitted together to create a continuous space. Alternatively several individual Maharajas can be set up together to form a matchless, highly interesting installation. Use Raj Tents thematic lighting to complete the look, using Moroccan or Indian themed lamps or crystal chandeliers hanging from the center ridge pole. In addition, Raj Tents, provides decorative perimeter lights hanging from brass brackets on the outside of the tent as well as different sized spot lights to go on the interior of the perimeter poles and wash the ceiling with filtered light. Raj Tents range of low furniture with corresponding cushion and bolster covers, together with matching hand woven dhurrie accent rugs, give you an exciting seating alternative to traditional chairs and tables. This is a extensive size tent in a creamy-white shade. our aesthetic party tents are water-resistant, quite resilient, and provides enough protected area. It is usually organized in a sequence, looks like a lengthy covering. 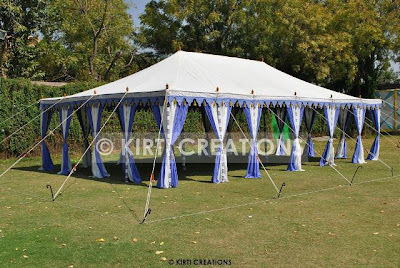 Whether you are having a wedding celebration for some number of visitors, enjoying an important wedding in the family, having a company release for six numbers of people or having a small romantic supper party with friends, Raj Tents Team can provide you with the perfect tents for your need. Alternatively, a whole encampment can be designed using different Raj Tent for cuisine, bar, food, dancing and individual getting to sleep tent.To complete your Raj Mughal Tents set up we have a lot of different relax furnishings, smooth furnishings, lighting style and components, all of which can also be leased out independently for inside activities. Raj Tents offer an extensive ranges of exclusive canopy, pavilions and tent available to buy or to rents for party, celebration, corporate meetings and wedding. All the tent are designed by hand in India, using natural material and employing many different local skill; block printings, dyeing, tassel makings, embroideries, mirror works, weaving and many more. They make an attractive alternative to the conventional nasty marquee. Tent is an perfect way of amusing, providing an attractive and versatile space for as many visitor as you want. They make an evocative establishing and show off a wonderful garden to its best benefits in sunlight or in rainfall. To enhance the tent we design a selection of our trademark relax furniture, pillows and soft furniturs, lighting and component. At Raj Tent our consumers wishe are at the leading edge of our initiatives and our devoted and expert set up team will do everything they can to create your occasion as unique as possible. This tent is sturdy and spacious because we use the high quality products in making of Lavish Party tent. It is designed in hut shaped and open from all sides. 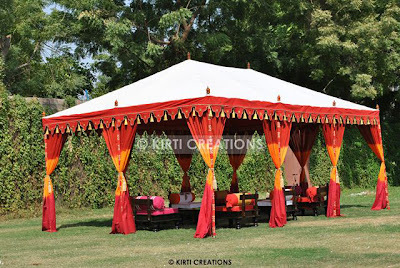 Maharaja and Garden tent are idyllic for big and royal events. These can be assembled in the specious places like garden and available in all imperial colors. The major advantages of Maharaja Tents are: customized tent. Tents are made by us are resilience, soft qualities, stable in any weather or climatic conditions.we provide excelent quality tents to our clients and check the our Raj Tent in all conditions before supply to clients.Our first slogan is our customer's fulfillment and following this direction we are always try to give our best performance to our customer. Handmade party tent is available in the several dimensions and requirements. Their styles of indoor and outdoor are amazing and huge it is available in various size and shades. Arranging is simple. We have the best employee and engineering team for manufactured or production the tents like Indian Tent,Raj Tent,Garden Tent, Raj Tents for Sale, Wedding Tent, Luxury Tents, Spacious Resort Tents, Mughal Tents,Fabulous Indian tent etc. 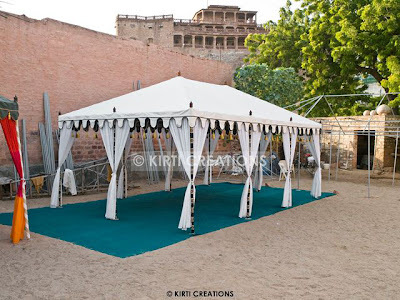 Raj tent is associated with Kirti creations which manufactured tents and supply tents,also provide tent on rental.We used latest design,colors and excellent quality material for making our service better in Raj Tents.We supply tents with 100% cotton.Garden tents are easy to set up anywhere on ground ,lawn etc. Read More. 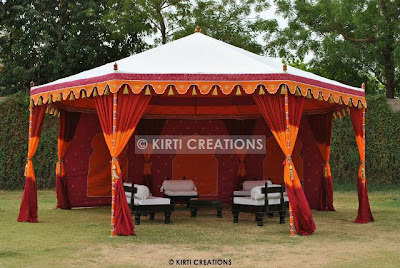 Our traditional party tents is uniquely deigned in the sires look like a long marquee which can be lodged huge events. It is for huge and unique parties. 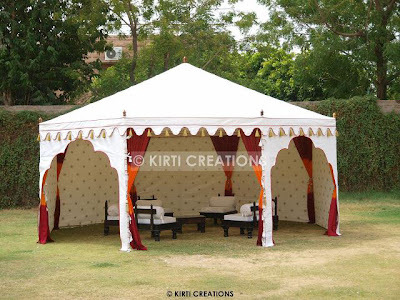 Traditional party tent brings the Native indian custom look in your celebration. A completely developed handcrafted party tents is ideal for all types of parties and events. It is resilient and setup easily anywhere. A completely developed fashionable celebration tent can either be used independently or in a mixture. This marquee is water-resistant, quite resilient, and provides enough protected space. 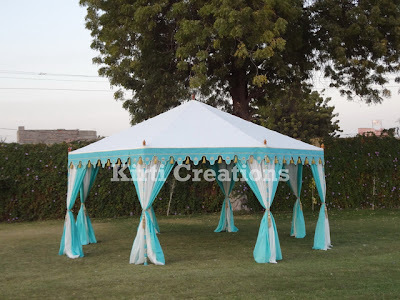 A traditionally designed party tent is organised up by side rules. Our traditional celebration covering is perfect for mid-sized celebration. Easily set in the backyard. Our Party tent is more required party tents in the market which has enough drapes, collapsed from the posts. The hut shape and great shade mixture of drapes and materials increase the beauty of this covering.